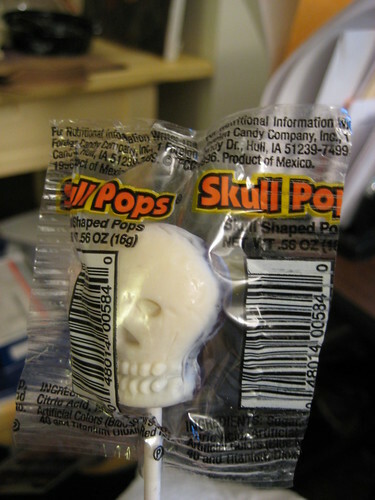 Amy just showed me this Mexican “Skull Pop” she got from someone at work. Something to do with Day of the Dead, I guess. there’s no mexican food in my neighborhood so I was unable to eat a sugar skull this year and I was too sick/tired/busy to go hunt one down. With all the hoolaboo about Halloween, I sometimes forget about Dia De Los Muertos. Maybe I can find one today….